For over 30 years trusted pastor and teacher John MacArthur has delivered practical, Biblical insights for helping Christians grow in their own journey of faith. Now the very best of John MacArthur's Christian living titles have been updated to feature a fresh look and study guides for both personal and group reflection. Am I really saved? Am I going to heaven? How can I know for sure? Every believer has wrestled with these questions at some point in their journey. 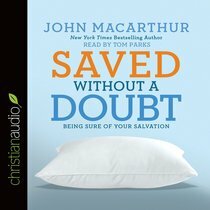 Saved Without A Doubt examines Scripture to uncover the truth of salvation, while addressing tough questions that can hinder our faith. Readers will develop a Bible-based theology of salvation and be encouraged to securely rest in their personal relationship with Christ. About "Saved Without a Doubt (Unabridged, 4 Cds)"